In case you were wondering, YES - we survived our half marathon on Saturday. 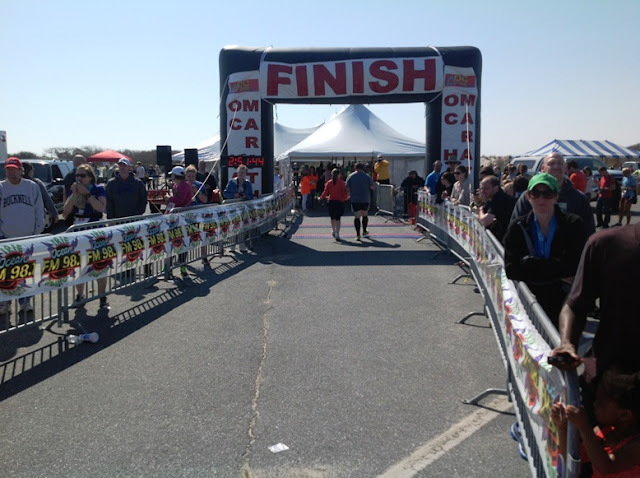 I mentioned back in November that Ez signed us up for the Ocean City Half, and then I purposely never mentioned it again. I don't have a lot of patience for reading about people's exercise regimens, so I didn't want to make a hypocrite of myself by blathering on about it here. But race day came and went, and I'm happy to say we had a really good time. To keep it brief, our training started off well and then petered out in January... I was majorly sick three times between then and March, Ez had really important work things happening and Johnnie went through a long phase of sleepless nights that made 5am runs extra extra painful. By the time race day rolled around, the longest run either of us had done was 6 miles.We were just not ready. But, since you know we are total gluttons for punishment who do things like major gut renovations and half marathons, we did it anyway. My original goal for myself back in November was to finish in 2:10 -- though we didn't come close to that, I'm pretty proud of us. Our survival strategy was to complete the whole race in intervals of 10 minutes running and five minutes walking, over and over. With this strategy, we kept a 12 minute mile pace all the way until mile 10. At exactly the two-hour mark, Ez's legs decided they'd had enough and started cramping from every angle, so we walked the final 3 miles. We finished with a time of 2:50 -- slow for sure, but not slow enough that they packed up the finish line before we got there. I am so proud of my husband -- who is more of a power lifter than a runner. He knew I was not terribly excited about running that far unprepared, so he tucked some baby aspirin into the pocket of his running shorts, loaded up the iPods and did it with me. That's love. Will I do it again, and train for real this time? I'm not sure yet. It was actually really fun and invigorating, and I'm glad we sucked it up and did it. In some ways I would like to do it again and actually run the entire thing, but training is boring for me... Running by myself on a treadmill at 5am is not awesome. After 3 or 4 miles I'm craving variety, and long distance running is a lot more time consuming than other workouts that are much better for your health and joints. I guess we'll just have to see. I did buy a pair of fancy new kicks in celebration of this small victory, and I took them on a short inaugural run yesterday. I could tell it was the beginning of a beautiful new friendship. How far they'll take me at a single clip is TBD, but we'll definitely be logging some miles together. Hey, what happened to your chair post? I was going to chime in. So did you buy them? Yes I did, but will probably sell them again if I can. Ez thinks they're hideous! I don't want him to have to live with them if he hates them! We'll see.